Chapel Bay Lodge is a ground floor apartment with a private patio garden overlooking the picturesque village of Port St Mary and the beautiful Chapel Bay with its sandy beach. There are ever changing views over the harbour dotted with trawlers and sailing boats, and the open sea beyond. There is direct access to the beach via a variety of walkways and paths, as well as vehicular access to the lower promenade. There is a catwalk footpath above the sea, following the edge of the cliff to take you round to the inner harbour and lower part of Port St Mary village. Inside Chapel Bay Lodge, you will find a bright and welcoming fully renovated apartment ideally suited to a couple, with excellent quality furnishings and decoration to reflect the seaside setting. A small porch leads to a raised area with a bay window and a step down into the lounge and dining area. There is comfortable seating on a large sofa and a dining table to seat four. Occasional chairs offer the flexibility to sit from different vantage points in the apartment and take advantage of the stunning views. There is a TV and DVD player with a range of DVDs available for viewing. The kitchen is fully stocked with brand new appliances, including electric oven and hob, fridge freezer, dishwasher, microwave, all crockery and cutlery as well as all the necessary pans and cooking utensils. There is a super-king size bed in the bedroom, which can be separated into two singles if necessary (please request when booking). There is a rear emergency access through a glazed door from the bedroom leading to stonewashed steps and a rear patio area. Please note this is shared with other residents in the building. The separate bathroom features a brand new bath and shower. There is gas central heating throughout the apartment and an electric log burner style fire in the lounge. A private, sheltered patio garden offer an ideal outside space for relaxation. Deckchairs and a parasol are provided. Parking is on the road in front of the apartment and there are no restrictions in place. A range of amenities is situated within easy walking distance including a variety of restaurants and cafes, a Co-op selling all essential groceries and three pubs. There is also a pharmacy, a hairdresser, and a newsagents with a post office counter inside. There is a larger supermarket called Shoprite in Port Erin, and in Douglas there is a large branch of Tesco near the railway station. Chapel Bay Lodge is easily accessed by public transport with regular buses servicing all parts of the Island. The closest bus stop is at the end of the road, on Station Road, not even 5 minutes walk from the apartment. The Isle of Man Steam Railway offers a charming and alternative method of transport and is an excellent means of viewing the Island’s beautiful scenery. Trains regularly depart from Port Erin Railway Station taking you to Castletown and Douglas, the capital of the Island. There is of course a stop at Port St Mary, which you can walk to from Chapel Bay Lodge in about 10 minutes, it’s about a quarter of a mile or half a kilometre. The Island is full of all sorts of attractions to interest everyone, and there is an information folder in Chapel Bay Lodge with details of as many as we could include! There is a veritable wealth of historical and cultural attractions such as the traditional Manx village of Cregneash, the impressive Castle Rushen in Castletown, Peel Castle, the Laxey wheel to name but a very few, all giving an insight to the Island’s unique Manx heritage. The Isle of Man boasts an impressive number of museums, varying from the nautical to aviation, to transport and motor museums, with the Manx Museum being the largest in Douglas. For sports enthusiasts there are of course the world famous motorcycling races: the TT (Tourist Trophy), the Classic TT (Manx Grand Prix) and the Southern 100, and then there is mountain biking, cycling, angling, adventure sports, go-karting, sailing, diving, paragliding… the list goes on and on. There are railways aplenty, including the Manx Electric Railway, the Great Laxey Mine railway, the Groudle Glen Railway, amongst others. The Isle of Man is a treasure trove for nature lovers who will find wildlife, flora and fauna in abundance, there are gardens to visit, nature reserves, marine nature reserves, seal spotting from the Sound, boat excursions to the uninhabited Calf of Man, and much more. It is also walkers paradise with an enormous amount of well marked footpaths and trails, including the challenging Millennium Way, from north to south of the Island, through the middle and for the experienced walker the Raad Ny Foillan, which follows the coast all around the Island. There are guided walks, glens and hills and much more to explore. Being an island, there are of course beaches aplenty from isolated, rugged and windswept, to stony coves and wide sandy bays, each with it’s own character and charm. The Isle of Man is a tantalising place to visit, and Chapel Bay Lodge offers the perfect accommodation from which to enjoy the sights and attractions of the Isle of Man, whatever your interests, whether you’re a thrill-seeking adventurer or looking for a tranquil and relaxing break. We welcome guests throughout the year, and our rates range from £65 to £80 per night (this includes linen, towels, heating and electricity) depending on the time of year you wish to visit, so please contact us to discuss availability and rates for the dates you have in mind. Please note there are higher rates for TT and Classic TT weeks and for Christmas and New Year bookings. Chapel Bay Lodge is situated on the Promenade in Port St Mary, which is a no through road, meaning little traffic. There is parking on the road in front of the apartment. There are no restrictions in place. There is additional parking 5 minutes walk along the road, in front of the Town Hall. Accept children (Minimum age) - We accept babies up to about a year old and can provide a wooden cot, however please note there are no child proof locks or gates in the Lodge which is why we do not recommend the Lodge for older more mobile infants. We accept older children however please discuss your requirements when booking. Car parking - Parking is on the road in front of the Lodge, there are no time restrictions, however please make sure you don't park beyond the pavement, along the broken white line as you are liable to get a parking ticket and fine. Linen provided - All bedding is included and provided as well as two hand towels, two bath towels, a bath mat, and a tea towel. 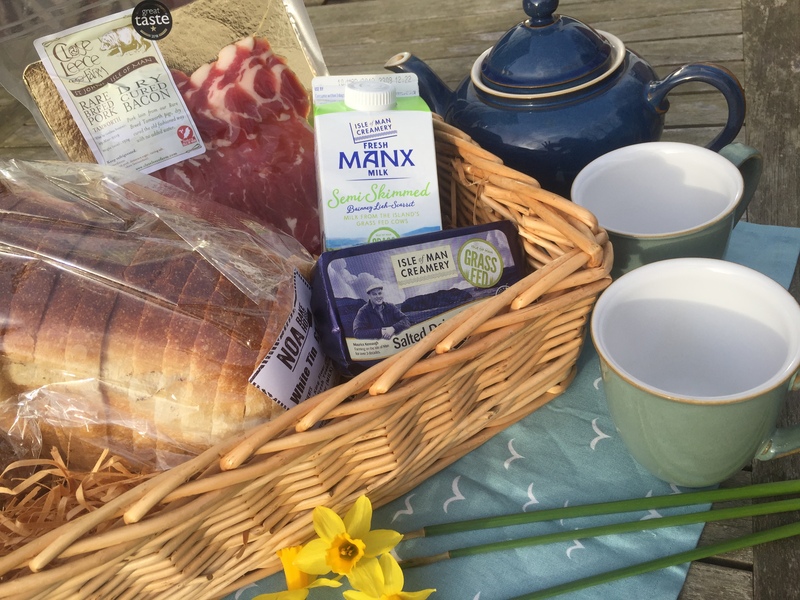 Bacon Breakfast Basket - Close Leece Farm premium rare breed Tamworth dry cured bacon, Noa Bakehouse bread, Isle of Man Creameries butter, Isle of Man Cremeries milk, orange juice, tea, coffee, sugar. 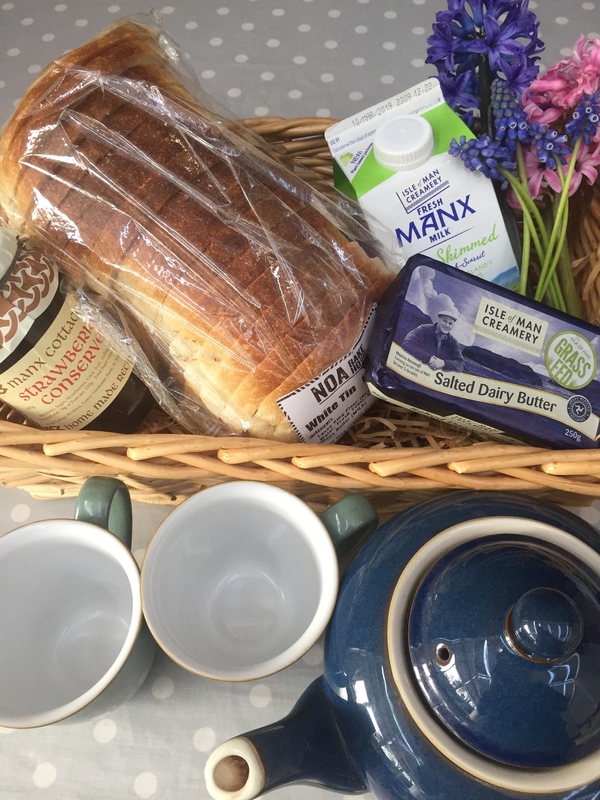 Jammy Breakfast Basket - Manx Cottage Strawberry Conserve, Noa Bakehouse bread, Isle of Man Creameries butter, Isle of Man Cremeries milk, orange juice, tea, coffee, sugar. To take advantage of this offer, contact Gaby at Chapelbaylodge@gmail.com, quoting 'BBB offer’ or 'JBB offer'. Terms and Conditions: Minimum 2 night stay, available for bookings to stay at Chapel Bay Lodge between 30 March and 3 May 2019. Treat yourself to a relaxing break by the seaside in Port St Mary, unwind and reconnect with our beautiful Island.